Like most years, last year's winner has influenced a lot of selections, so we are wading through a sea of Sad Female Balladeers. You have been warned. Most of them will have fallen by the wayside once we get to the Grand Final, but if you plan on watching the Semis, make sure to have some coffee ready. You'll need caffeine (and snacks - always snacks). One of the red-hot favourites appears as the very, very first entry. Sweden has sent the lean, slick pop machine of Robin Bengtsson's I Can't Go On. This Robbie Williams/Justin Timberlake hybrid is hard to fault, except it is perhaps too smug and impressed with its own brilliance. Strong vocal performances from Georgia, Albania, Poland, and the Czech Republic cannot disguise the fact they are all Sad Female Balladeers. They all need big performances and outstanding staging to stand out from the rest of the pack. I am not sure they can manage that. Finland also has a Sad Female Balladeer but it stands out - and not just because it also has a Sad Man At Piano. Norma John's Blackbird reminds me of Annie Lennox at her most sparse and interesting. Hopefully they won't change the staging too much: at its national finale, it was atmospheric and gorgeous. Belgium has one of the pre-contest favourites. The country has quietly become one of the strongest competitors (2015's Rhythm Inside, anyone?) and this year the hype is deafening. Blanche's City Lights is just stunning. It is a song meant for the radio, the end credits of a great film, your headphones .. but is it meant for Eurovision? I hope its introspection will translate well to the stage. It deserves all the love in the world. Another underperforming country is Iceland which has sent us several great tracks over the years that never quite made a suitable impact. I freaking love this year's song from Svala with its cool Chvrches vibe, but I'm not fooling myself into thinking it'll do well. It's all a bit too brittle and remote for Eurovision. One of the great rivalries at 21st century ESC is the one between Azerbaijan and Armenia. This year Azerbaijan edges ahead with the cool Dihaj and Skeletons, but Armenia possesses a song that's the closest to a Big Balkan Ballad we get this year (even though they are nowhere near the Balkan region, obviously). The BBB is a perennial favourite with Eurovision viewers, so it could surprise. Speaking of surprises, I never thought I'd be head-over-heels in love with a song from Portugal. I never imagined I could get goosebumps from listening to a Eurovision entry sung in Portuguese by a scuffy-looking man. And then Salvador Sobral started singing. ESC fans have criticised the song for being old-fashioned, but this is the year Ryan Gosling nearly tap-danced his way to an Oscar in La La Land. Salvador Sobral's song is both timeless and very, very now. I'll be listening to this in 2037. The run of Sad Female Balladeers continues, but at least The Netherlands is giving us a Wilson Phillips tribute act with Lights and Shadows. I never liked Hold On first time around and I'm not a fan of this one either. I do really, really, really like Macedonia's entry. Jana's Dance Alone is pure synth-pop goodness with shades of Kylie, Robyn and Tegan & Sara. This is a potential Top 5 and I'll be dancing like a loon to eminently quotable lines like "I let the pavement be my catwalk". Please, please let the staging be amazing. From the sublime to the ridiculous: Romania provides us with the novelty hit of the year with the horrific Yodel It. It'd be to everyone's credit if this track died in the semi-final because the Saturday casual viewing crowd will award this gimmicky trainwreck far more points than it deserves. It is my least favourite track this year. Horrid on all levels. This semi-final has its share of Sad Female Balladeers, but we are also blessed with a number of Generic Male Pop Singers. Austria sounds like it was written for an aspirational lifestyle ad, Ireland has sent its latest Louis Walsh protegee (your gran will love it), and Bulgaria brings the best of the bunch. Norway brings up the rear with the cookie-cutter Grab the Moment. Israel is upbeat, thankfully, and although it isn't particularly interesting, it could do well if staged with energy. I'm reminded of Israel's 2015 entry which I didn't rate until I saw it on the big stage - this year has the same potential to be the crowdpleaser of the night. I'm of A Certain Age, so my first thought on hearing Estonia's Verona was 1980s German pop duo Modern Talking. Granted, this sound has also been mined by Lady Gaga for the epic Bad Romance, so it's not all bad. Verona has a real ear-worm quality to it with a strong 1980s pop sound, but I worry about the delivery on the night. If Koit & Laura manage to connect with each other & the camera, this could go far but it could also easily end up as dad-dancefloor cheese. Ah, the batshit-crazy song from Croatia. It sounds like a Disney/pop-opera mash-up until you realise that Jacques is singing both voices. I have no idea how he's going to do this live nor how it will avoid looking utterly insane on stage. It would have worked a bit better if it had been a duet, but .. it is bizarre and incoherent. The Big Five are pre-qualifiers: Spain is hopeless, France is once again excellent and will probably underperform (see 2013's Amandine), Germany has sent a wanna-be Sia with a generic song, and UK is a Sad Female Balladeer (incredible voice; underwhelming song). And before we get to the last of the Big Five pre-qualifiers, Ukraine are also pre-qualified as hosts. I'll also get back to Ukraine in a second. The last of the Big Five is Italy and they are entering the competition as absolute favourites. I'm personally not convinced we will see an Italian win - but Occidentali's Karma will be a Top 5 song, no doubt. I have the same problems with Italy as I have with Sweden - I don't feel a connection, it is entirely too self-aware of its own brilliance, and it has a calculated gimmick. Mind you, I felt the same about Denmark in 2013 and Sweden in 2015. They both won. Politics have always been part of Eurovision. The contest was started as an attempt to bring Europe together after the horrors of World War 2, and you even had Italy win in 1990 with Insieme: 1992 - a song that explicitly celebrates the fall of the Berlin Wall: "With you, under the same flags / You & I under the same sky / Together, unite unite, Europe / We're more and more free / It's no longer a dream and you're no longer alone (..) / Europe is not far away". In recent years, the tone is less celebratory and less peaceful. Georgia withdrew in 2009 with a song called "We Don't Wanna Put In" (spot the unsubtle message) and its 2009 singer is actually back this year with a song which was staged in Georgia with explicit anti-war messages flashing. Much of the pre-contest coverage this year has centered on Russia fielding a singer who is legally unable to perform in Ukraine. ESC Insight has an excellent article about the geopolitical forces behind all this. Russia has withdrawn from this year's contest (as of yesterday), but expect politics to rumble on. Eurovision has always been used as a way to present your nation on a grand stage (literally) and many people have vested interests in telling a specific version of their country's story to a mass audience. Be prepared to see a lot of not-very-subtle political messaging even if the EBU are trying to smooth things over. We live in troubled times, but the tagline of Eurovision 2017 is Celebrate Diversity and I'll be doing just that in May. Fashion. I was one of those people who always said I didn’t care about fashion because fashion didn’t care about me, but in the last decade or so, I changed my mind. Maybe it was my move from Copenhagen to Glasgow that prompted my change of heart? The two cities have radically different approaches to fashion. Maybe it was because I began making clothes? I started thinking about necklines and silhouettes in another way. Whatever the reason I began thinking about fashion as both visual communication and social history. I spent last week doing jury duty. I was never picked to sit on a jury but I spent several hours every day sitting in a crowd of around 100 strangers. It was so interesting to observe what people were wearing. It was a sea of black trousers, various blouses, and suits but people still looked so different depending upon the cut of their trousers or how their jacket sat. One guy stood out for a slim-cut navy suit with brown brogues - I imagined him working in media or the trendy part of IT. Another man wore a loose, baggy suit that screamed 1990s to me - I guessed that maybe he didn't wear suits to work and only owned this one suit? What people wear say a lot about them - just as much as body and verbal language do. What has this to do with me working as a designer? I don't live and work in a context-less world. I am influenced by what I see around me as much as anybody else. I have my own specific aesthetic which is tied to my body, my colouring and my love of vintage shopping. I design things that I want to wear myself (unless it is a very, very, very specific brief which rarely happens). I have pinterest boards that I edit frequently to help me hone my aesthetic (How to Wear Clothes is my imaginary wardrobe, for instance; Knitting Inspiration does what it says on the tin). I keep an eye on people like Shirley Kurata whose stylistic instincts I admire. I also spend a working day each season going through catwalk shows on style.com thinking about things like necklines, colour combinations, sleeve caps, tailoring etc. You may not be able to see all this work in my design, but it is there. When someone commented on the Lindgren mittens saying "they look like the most amazing vintage find!" I had a quiet, internal fistbump of yay, yay, yay, that is what I wanted to say! I think talking about hand-knitting in a fashion context is always likely to be fraught with danger. I know many Ravelry people have the same 'I don’t care about fashion because fashion don’t care about me' stance that I used to have (which in its own way is a reaction to fashion - or at least the fast fashion of the retail world). But what we choose to make speaks its own language and forms part of social history (increased leisure time; rejection of consumerism; ethical consumerism; concerns about sustainability; the rise of nostalgia industry etc). Clothes are never 'just' clothes. I'd argue we even see micro-trends within hand-knitting that are as much about fashion as we'd like to pretend they are not. What are your thoughts on the act of making and fashion? Do you try to imitate current high street trends? Do you have a specific style you try to make? Do you follow making trends and like making 'the in-thing'? Do you follow fashion? How do you think about the clothes you wear & make? Currently BBC4 is showing a series about the independent music business in the UK. The series traces how record labels like Factory, Rough Trade, Mute, 4AD, and Beggars Banquet made it possible for less mainstream bands to release records. Many of the bands turned out to be hugely influential and enduring (Joy Division, New Order, The Smiths, Depeche Mode, The Stone Roses, Suede, Franz Ferdinand, and Arctic Monkeys to name but a few!) and today UK indie labels continue to champion new music that would never be signed by major labels. As someone working as an independent knitting designer, I recognised a lot of what was being covered in the documentaries - from small record labels operating out of a bedsit in Sheffield via creatives forming loose partnerships to dealing with complex distribution problems/solutions and worries over intellectual properties. I love many of the bands covered by the documentaries, but it was eye-opening to see how much of the amazing music was being created in an environment that was in many, many ways similar to how the indie knitting industry works. Everything I do is created at my kitchen table. I have a small nook with a desktop computer (which needs replacing) and some bookshelves where I keep all my designing resources. I create my own layouts, my partner does my photography & art, I model my own designs, and everything passes through my hands. I deal with emails, accounts, wholesale, distribution, workshop dates, social media, marketing (which is always my sore spot), and obviously pattern designing & writing. I hire in technical editors to work on my patterns, but what you see is what you get and you get me. And most indie designers work like that. Some have pooled resources, others have grown to the stage where they have one or two people on staff. But we are all just very, very small independent ventures. Why be independent? Is it that much fun to do accounts at 11am on a Friday night? I think most people understand the allure of having full creative control - and yes, being able to decide what to design in which yarn is amazing - but the allure of intellectual property is even stronger. Quite simply, indies choose to own the right to their work. I learned a hard lesson when I first started out: I handed over the rights to a pattern for a pittance and saw somebody else make a lot of money from it when I could barely cover rent. And that got me thinking. I still work with mainstream publications on occasion (and some of them are incredibly indie-friendly and lovely!) but time & experience has taught me to be wary of Big Besuited Companies offering me deals too good to be true. Indies pay the price by having to do all the things - including all the tough things mainstream publishing would normally have done for us - but I maintain it is worth it. So, clutching my gladioli, I began thinking about where indie knitting businesses are heading. The BBC4 documentaries on UK indie record labels traced the trajectory from bedsit record labels with rough DIY graphics to bands like The Smiths appearing on prime time TV and finally a world where indie labels are regularly outselling the big record companies. Knitting is not the music business (there's a big difference in gender make-up for one thing! It made me sad to see many female musicians simply disappear as indie music became bigger in the 1980s and 1990s) but maybe there are lessons to be learned there. Surround yourself with people who understand and support your ethos. Don't try to follow the crowd but embrace what sets you apart. Take control of as much of your own operations as you possibly can. Choose your collaborators with care and imagination. "Indie"can become a very diluted term when Big Besuited Companies realise it is an untapped market - this will result in products that look, talk, and walk like indies but have big money and committees behind them. Don't believe the hype lest you want to turn into Morrissey!! There isn't a right or wrong way of making it work as a creative. Some people work best as part of a larger team with stylists, graphic artists, distribution centres, remote printing, and so forth. Then you have stubborn donkeys like me who enjoy having my fingers in every pie. What about you as a knitter? Some knitters love following a particular design house and yarn brand with big budgets and aspirational marketing; others find themselves more at ease at an indie show where they get to know the dyers and the designers. Some people prefer buying a magazine with glossy ads and a plethora of patterns; others like buying single patterns they have especially chosen for one particular yarn. And some prefer to just spin their own yarns and knit without a pattern. The world is your oyster - you can to pick and choose as you like. And as an indie girl that really makes me happy. Many people don't like the World Cup in football. I do. It makes for great sample knitting company (especially because I have no stakes in this tournament) and I can zip through my to-do pile a lot quicker than if I were stuck watching TV series or films. And, honestly, I find assorted Tumblrs and various memes hugely entertaining. On that note, I would like to share my own World Cup injury. It seems as though there is apparently such a thing as too much knitting. Won't stop me from applying bandages and heading back onto the pitch. After all, I have matches to watch and things to finish. PS. button brains, I am looking for seven dark wooden buttons roughly 18mm - any good UK suppliers I've missed? The usual suspects of Textile Garden, eBay and Etsy have failed me. 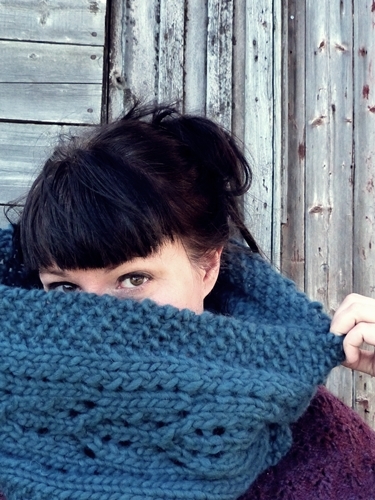 Online identity, knitting celebrities and internet jealousy. We have covered a lot here recently. I'm going to return to the discussion but first I want to share a slice of what it is all about (for me, anyway): knitting. This morning I cast off another sample for my Doggerland collection. I think I first mentioned the collection about a year ago - well it has been a long journey to get here and I'll write more about this as I release the patterns. 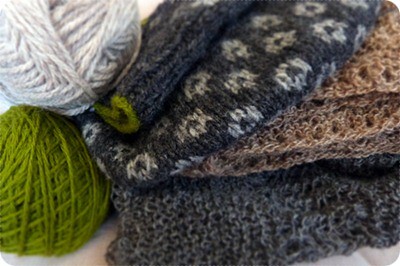 But I just love looking at this pile of samples (plus random bits of yarn). The pile looks so right even if the samples still need to be dressed and it is lacking a couple of core pieces still to be knitted. I am getting there! Woo! And I think that brings me neatly round to the topic that Fourth Edition has been circling around recently: success. Some people want a big car. Other people want to be recognised in the supermarket. All of us want to be able to pay our bills. I have spent a lot of time thinking about success and how I define it. I like being able to pay bills, but I am definitely not concerned with driving a car or being stopped in the street. No, I really truly love when what I produce resembles what has been going on in my head. When my brain and fingers work together to produce something that stays true to the core idea and tells the story I want to be telling. 'Story-telling' was a recurrent word in the discussion. It is perhaps a post-modern conceit that we tell stories in order to construct ourselves but I think I do relate to my craft and my designs as forms of story-telling. I want to explore my Scandinavian heritage; the landscapes both inside and outwith myself and try to make sense of the world through knitting. I somehow worry(!) that I hover between textile art and textile craft - that somehow my ideas are too absurd and abstract for the relatively simple pleasure of working a piece of string with two sticks. I have spent almost 12 months trying to nail Doggerland because it started out as a huge, unwieldy idea. When I showed my introduction to some friends, the feedback was enthusiastic but agreed that maybe I should try to be a touch more accessible. And so I am here looking at a pile of unblocked knits and I feel so proud. To me, this is success. And this is who I am: I design knits inspired by psychogeography, land art, and Mesolithic archaeology. I wear red and green together. I am quiet in public and most happy when I'm with just a handful of friends. I love early 20th century culture and T.S. Eliot is my favourite writer. And I think the Eurovision Song Contest is the best thing since sliced bread. All that combined pretty much disqualifies me for any position as a lifestyle guru. Also, I eat the cake as soon as it's out of the oven. Besides, the idea of a knitting celebrity is still weird. If the founder of Wikipedia has trouble identifying himself as 'internet famous', I think it's fair to say that we need to re-assess the whole idea of internet fame. The internet is an awfully big pond. A Dash of Colour, Beauty & Cynicism. I have been working a lot with undyed yarns recently - one mossy green has crept into the Doggerland collection but otherwise I am using all natural fleece colours. I really enjoy it - of course I do - but I do yearn for some colour in my knitting. Just a little pop of something decadent. A bit of birthday yarn arrived yesterday. My lovely gran sent me 1100 yrds of 2ply merino wool from Danish company, DesignClub. 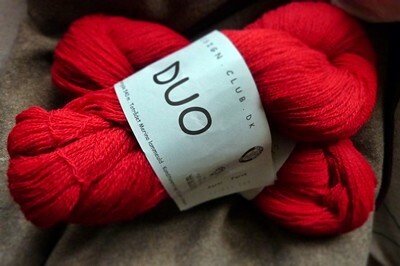 This red is marvellous - it has unusual depth to it and the yarn has some great bounce. It was spun at Henrichsens Uldspinneri, a Danish woollen mill dating back to the 19th century. I've used the yarn before and I am looking forward to using it again .. 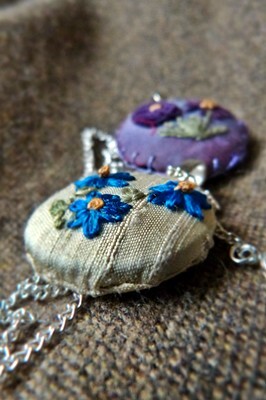 I thought I'd also show you the necklace pendants which my friend Paula made for my birthday. They are so pretty. I was recently sent a link to Craftypod - specifically an episode which discussed the idea of "the knitting celebrity" and internet jealousy. It is a really interesting podcast and if you can spare 30 minutes, I recommend you give it a listen. First, though, some words from Wikipedia founder Jimmy Wales. He was asked about being "internet famous"
Right now, I'm sitting in a public library minding my own business taking a break from what I was working on. No one is likely to recognize or notice me here.. But I am, as the question asks, "Internet famous". That phrase is vague and could mean a lot of things, but for me what it means is that Wikipedia is very very very famous and Wikia is very famous, and so I'm a little bit famous as a result..
Back to the Craftypod podcast. I was struck by a couple of things. 1) Craft is HUGE. There are hundreds, if not thousands, of segmented markets and niches: knitting, crochet, scrap-booking, quilting, embroidery, dress-making.. These days knitting can be divided into a lot of niches too (I have written a bit more about that here). Vickie Howell may talk about being a leader in the craft industry - but it is her corner of the craft industry in which she is a leader (gatekeeper is probably the better term). This probably makes me a bad person, but I had never heard of her before I listened to the podcast. I googled her subsequently and she's done craft TV in the States, works for a US yarn company and fronts her own yarn line. She looks like a cool person - but she is not part of my knitting landscape. And that is okay. I'd hate to have a totally uniform definition of "cool knitting" and what I "should be knitting". 2) There was also a lot of talk about "the 2005 generation" and marketing. The podcast served up a massive dollop of nostalgia for the good old days when you could upload a simple scarf pattern and people would go nuts for it. I think there will always be people talking about the "good old days when things were simple". It is a generational thing and on the internet a generation is a very small, finite thing (maybe 2 years? 3 years?). 2008 was the year when I got back into knitting in a major, major way. I remember when the February Lady Sweater was published via Ravelry and it was a huge thing. Do we have that sort of knitting landscape these days? No.It is probably harder to get noticed across the board, but incredibly talented people do manage it. Designers have to up their game and I don't think that's a bad thing. Knitters everywhere are the winners in this scenario. I'll be honest: that podcast made me feel very cynical and I don't like feeling cynical - especially not about knitting. I don't have a lot of money. I don't have a lot of power in the top-down command-and-control sense. But I do have a lot of influence. I like that part of it. Jimmy Wales is a lot more famous than any knitting "celebrity" and wields a lot more power and influence than I can begin to imagine. Yet he speaks with humility and a wry sense of humour. I think we could all take a lesson from him.